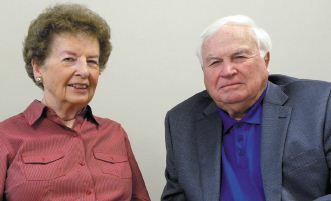 “In the late 1950s, we moved to Bellevue, Nebraska. At that time, the Columbans hosted an annual festival in the summer. We decided to volunteer at the festival since, as parishioners at St. Mary’s in Bellevue, we knew many of the Columban priests who said Mass at St. Mary’s and it seemed like a good way to get involved. "Soon, our relationship with the Columbans deepened and evolved beyond festival participation. We are delighted to have developed friendships with so many of the Columban Fathers over the years. They are truly ‘priests of the people’– down to earth, easy to relate to, and genuinely interested in others. "After so many years of friendship with the Columbans, we decided that we wanted to make a legacy gift. God has richly blessed our lives, and we wanted to give back in a way that would benefit others. "The Columban Fathers is a great organization. As the role of mission changes around the world, the Columbans continue to adapt to the needs of the people they serve. Continuing to learn about where the Columbans are working via the Columban Mission magazine and talks by Columban priests reinforces our desire to give by making us more aware and appreciative of what the Columbans are doing around the world."